The resources offer innovative ways to enhance young migrants' education by developing links between schools, the home and local partners in education. This educational joint venture develops the learners' skills in the language of schooling as well their plurilingual competences. The Virtual Open Course is composed of modules containing multimodal materials, pedagogical ideas and downloadable guidelines for all members of the learning community. Video presenting the publication on the occasion of the ECML conference in December 2016. The presentation took place in the context of a workshop involving results/publications of two related ECML project (Pepelino and Parents). I now am more aware of the fact that you develop learning power when you connect school, families and community. 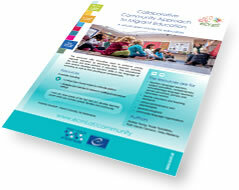 These pages result from a project run within the ECML's Learning through languages programme entitled "ECML publications for plurilingual and intercultural education in use" (Community).